It seems that owning a TV alone is not good enough these days, as one would do well to have a TV that is large in size. After all, there is nothing quite like having the feeling of bringing in the cinema experience to the living room, is there? 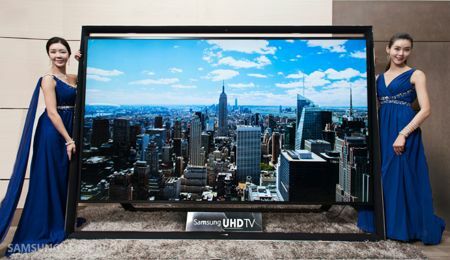 Samsung intends to lead the way with the introduction of what they deem to be the world’s largest 110” UHD TV over at CES 2014. Also known as the 110S9, this Samsung device is the world’s largest commercial Ultra High Definition TV, where it will sport some of Samsung’s innovative technologies including the Quadmatic Picture Engine that is touted to deliver unrivaled picture quality on 110S9’s 110” UHD screen, which would then bring to life its 800-megapixel display. We are talking about more than four times the number of pixels on a Full HD TV here, people. Samsung expects to see additional demand grow for the 110” UHD TV market segment, where apart from rich folks who have way too much money to spare and spend, other clients would include government institutions, agencies and companies from around the world who want to have that “Wow!” factor when it comes to beautifying their offices and impressing all who step in. This particular TV will arrive in the new rich markets of China, the Middle East, and Europe later this month, and you can bet your bottom dollar that folks from China as well as the Middle East will find it to be not an issue in purchasing one, or perhaps even two of these bad boys. After all, those are the places where the nouveau rich reside, and it is not out of their character to splurge just because they can. Needless to say, pricing details have yet to be revealed, but in this case, if you have to ask, you probably cannot afford it.